DID CLUB FOR GROWTH TRY TO SHAKEDOWN TRUMP? It looks like one of the preeminent tea-party-aligned groups has been outed for an attempted shakedown of GOP presidential front-runner Donald Trump. 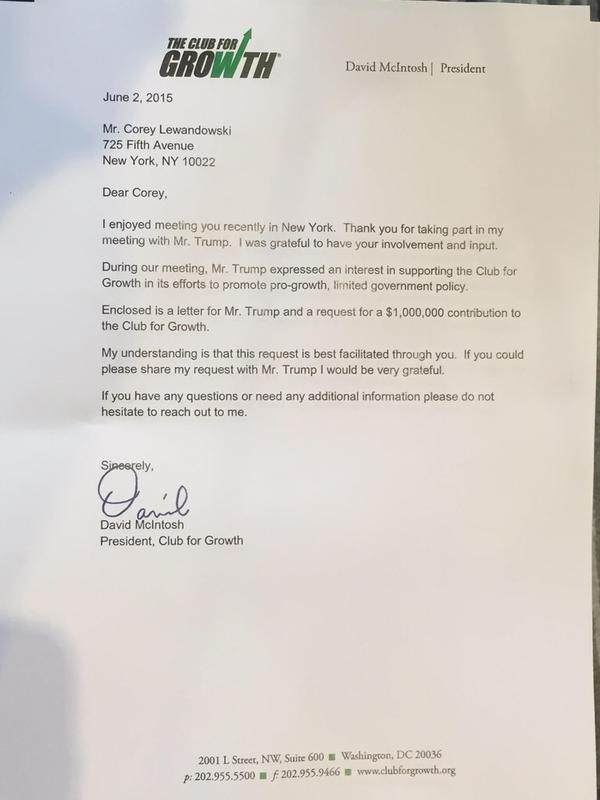 According to Trump, the tax-cutting advocacy group has started running an attack ad campaign against him because he refused Club for Growth president David McIntosh’s request for a million-dollar donation. Trump asked the group to release the letter McIntosh had sent him on June 2 requesting the donation. When the group didn’t respond to his request, Trump posted a copy of the letter on Twitter. “What we’ve said to our members is that ‘Trump is a liability to the future of the nation,’ and we’ve asked them for support for Club for Growth Action to get that message out. We’re also doing research, like we do on candidates, into his economic policy positions. At this point, we haven’t taken anything off the table – be it TV ads or any other means – to expose Trump as not being an economic conservative, and as actually being the worst kind of politician,” said David McIntosh, Club for Growth President. For more on the story, see Trump: ‘Phony’ Club for Growth ‘Total Hypocrites’ and Club for Growth declares war on Trump. New York City chef Diego Moya was attacked and brutally beaten by a group of six to eight feral blacks, ranging in age from 16 to 21, while visiting friends in Philadelphia. The ferals broke Moya’s nose in several places, fractured his jaw, and left him unconscious and bleeding on a stoop in Old Town Philly. Moya wasn’t robbed and police haven’t determined a motive for the unprovoked attack. Groups of feral blacks have been attacking unsuspecting whites, Asians, and Jews without provocation in what is known as the “knockout game.” The goal of the game is to knock out an unsuspecting victim with one punch. For the players, it doesn’t matter if the victim is young or old or male or female. The problem is that most whites are afraid of being called racist and most blacks refuse to speak honestly about racism within the black culture. Blacks understand how the charge of racism affects whites, and they charge racism to silence critics of black culture and to shut down discussions involving racist hate crimes committed by blacks. Whites must get over their fear of being branded a racist and begin to speak out against black racism, no matter where it rears its ugly head. Most white Americans won’t tolerate racism toward blacks from family members and friends, yet they tolerate black racism that can put them in the hospital or the morgue. It’s time whites speak up and end the racial double standard. Racial demagoguery coming from influential black leaders fuels anger toward whites and encourages feral blacks to attack them. Hatred for whites is reinforced and encouraged by Al Sharpton, Jesse Jackson, Barack Obama, and even Oprah Winfrey, who called whites racist for opposing Obama’s policies and said that older whites must die before racism would diminish in America. Repeatedly playing the race card hurts race relations and divides the country like nothing else; yet Obama and black leaders continue to play it every chance they get, which makes me think that the knockout game could be a recruitment test for future members of his civilian police force. The two-hour show aired Friday, Nov. 29, 2013. TMR was broadcast live M-F from 10:00 am – noon on channel 2.